Part of what keeps me coming back to Spider-Man years after opening up my first Amazing Spider-Man comic book is his long-standing hopefulness. What makes this hopefulness so effective is the fact that it’s contrasted by a character who’s backstory is predominantly cynical. Peter Parker/Spider-Man is an orphan, who’s indirectly responsible for the death of his Uncle, has a media baron using his newspaper to turn public opinion against Spider-Man and is forced to make great sacrifices I his personal life because of the secret life he lives as a masked hero. Yet despite these dour circumstances, Peter/Spider-Man is a positive character, who routinely chooses to fight through the negativity and do what’s right by taking the high road. And he does that, in large part because he’s hopeful that by acting this way, the tide will eventually turn in his favor. In the three-part Fear Itself: Spider-Man miniseries, the final chapter brings Peter and the issue’s readers face-to-face with Spidey’s biggest fear: a world without hope. Throughout this series, New York City has been thrown into chaos as negativity and fear are the pervasive emotions for all of the city’s inhabitants. In my analysis of the second-part of this series, I talked about how Spider-Man was fighting so valiantly not only because he feared for the lives of these innocent people who were seemingly possessed, but out of fear that New York City was devolving into some kind of hopeless, violent mess, similar to the 1960s-1970s-era Manhattan that is often portrayed as downtrodden and unsafe in popular media. In the third part of this series Spider-Man is in a fight for his life against some kind of demonically-possessed Thing (Ben Grimm). As Spidey stands about one-more devastating shot away from death, he talks losing hope in himself and in the world in general and how that is his predominant fear. 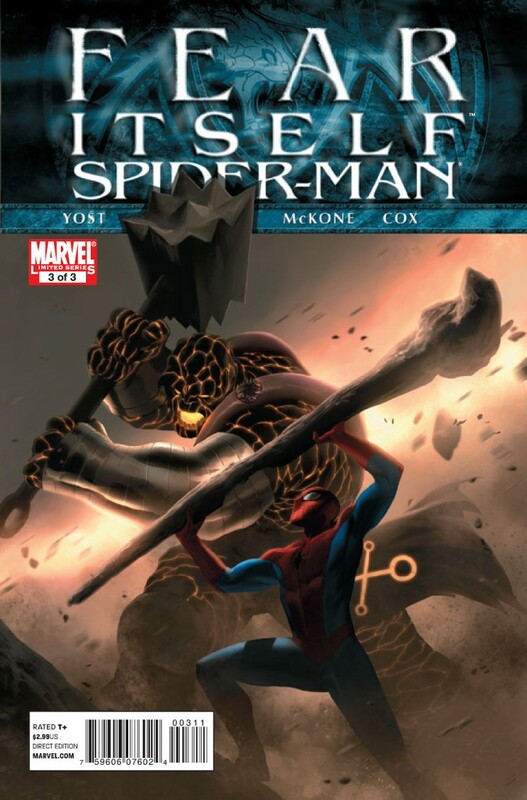 In some of Spider-Man’s most famous moments – lifting the heavy machinery off his back to succeed in ASM #33, overcoming the unstoppable Juggernaut in ASM #229-230 – Spider-Man has able to succeed in this dire circumstances because he’s kept hope alive in himself and in his mission as a hero. 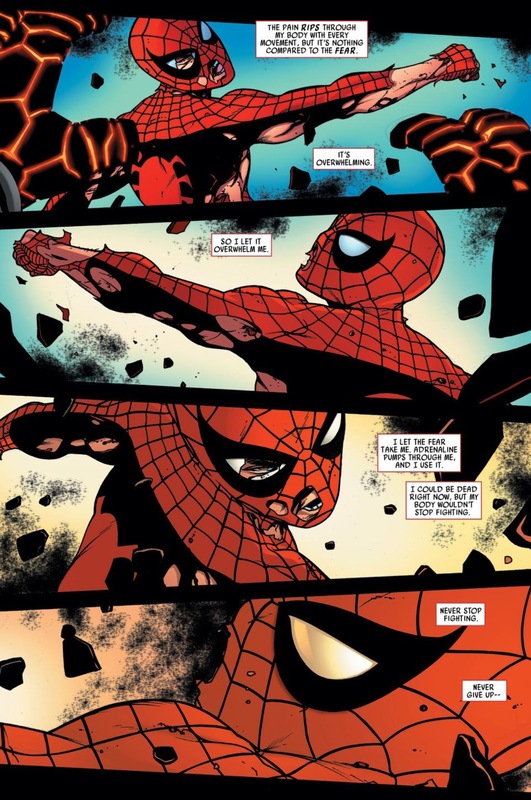 In the third-part of Fear Itself, Spider-Man has seemingly lost hope himself during battle and doesn’t see a way to succeed as he was able to do in the past. However, because he recognizes the hope others have in him, he’s able to power through – or essentially luck his way through when the demonic Thing takes off before delivering the final death blow to Spidey. 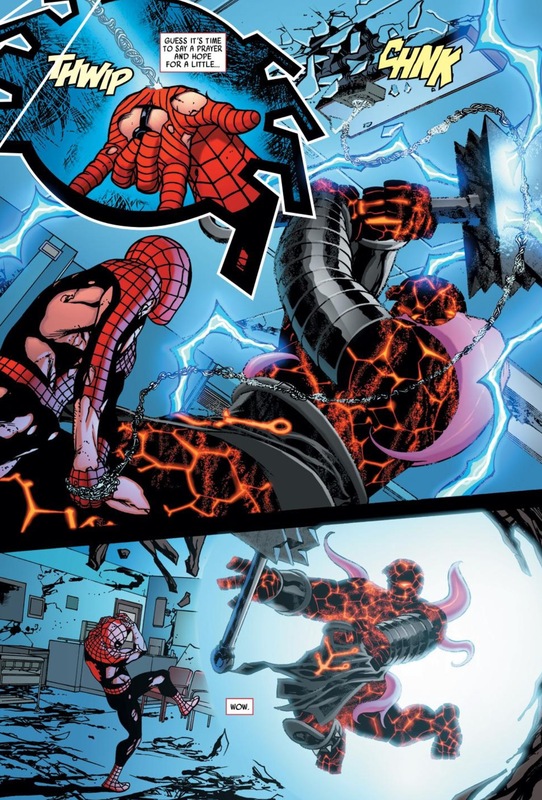 I thought it was an excellent way to tie-in the overall theme of the Fear Itself “event,” though looking at the three-part Spider-Man centric series as a whole, I do question the roundabout way the creative team got there. The storyline involving Vermin in part one and two seemed pretty inconsequential in retrospect when there was obviously a lot of conflict that could have been weaved in if Vermin’s role in Spider-Man being buried alive in the Kraven’s Last Hunt storyline from the 1980s was referenced in a meaningful way. That storyline is one of the few occasions where Spider-Man was soundly defeated and even after he escape his grave, he could not exact any kind of retribution on Kraven since the guy killed himself. 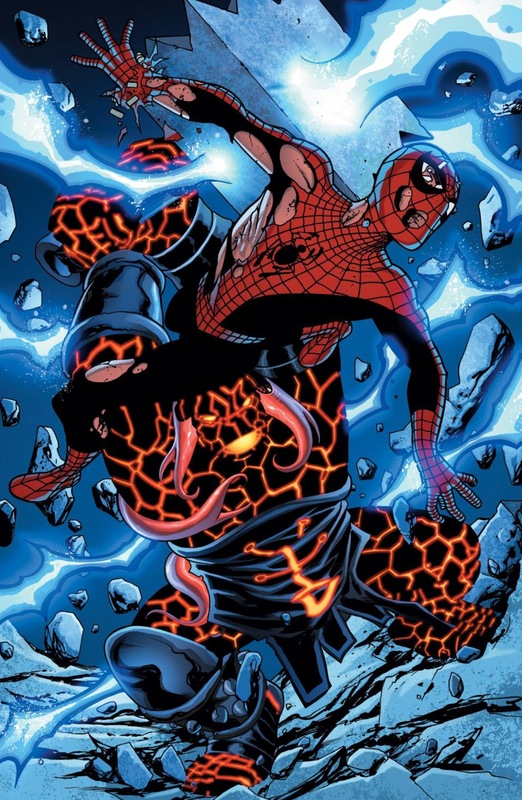 Instead, the miniseries couldn’t even arrive at its thesis statement until nearly halfway through the third part of the series, when Spider-Man was up against an entirely different villain. Yet the idea of Spider-Man fearing lost hope the most is a pretty spot-on interpretation of the character. So perhaps the journey to that point is ripe for criticism but the final arrival point is worthy of praise. Regardless, this is the risk you run as a comic book publisher when you try and tie-in too many moving pieces into one overall comic book megaevent. The plotting isn’t always terribly efficient as the creators are trying to get three comic books worth of a series out of something that probably could have been effectively told in one issue.